Breathtaking Photos Of Statue Of Unity That Will Blow Your Mind - Bold Outline : India's leading Online Lifestyle, Fashion & Travel Magazine. Move over Statue of Liberty, we have a much bigger and taller effigy in India. 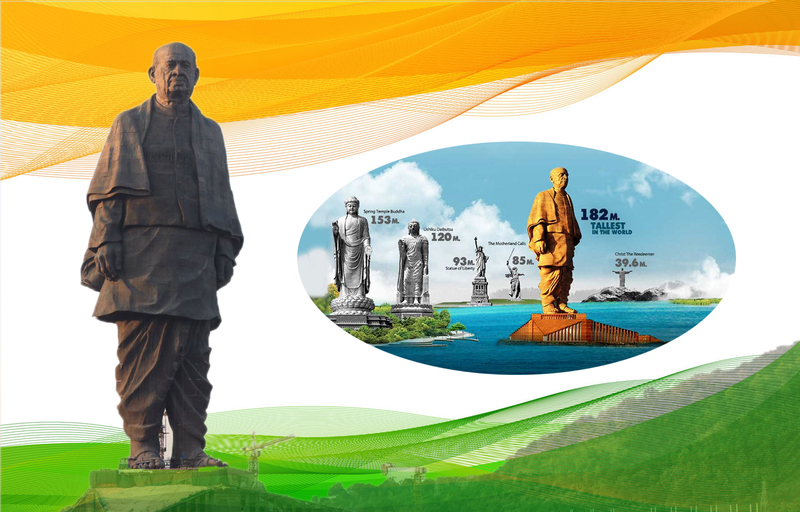 The mammoth 182-metre Statue Of Unity, dedicated to freedom fighter Sardar Patel, was unveiled in Gujarat by Prime Minister Narendra Modi in a colourful ceremony. The sculpture is now the tallest statue in the world and is twice the height of the Statue of Liberty in the United States. Take that America! Also, it is 177 feet higher than China’s Spring Temple Buddha, which was the tallest statue till now. The statue was made using more than 70,000 tonnes of cement, 18,500 tonnes of reinforcement steel, 6,000 tonnes of structural steel and 1,700 metric tonnes of bronze. It was designed by Padma Bhushan-winning sculptor Ram V Sutar and it took Three and a half years to build it, with as many as 3000 workers, including 300 engineers were involved in the building process.